Lenora: And me. Here to give you the scoop about what’s been happening in East Aurora. Irene: Not that we’re gossipy old biddies, you understand. But who better to give you the full story than someone who’s got a little age on them? Gives you a little perspective. Lenora: We could tell them about the cupcake shop closing and the new tea shop opening in its place. Irene: I think they’re looking for something juicier than that. Lenora: I guess the thing that’s got people’s jaws yapping is that whole mess with the new chief of police. Irene: New? He’s been here for over three years now. Lenora: Uh-huh. And in small towns, you know that’s new. Irene: You got a point. Turns out nobody really knew him. Here we thought he was on track to becoming the town’s most eligible bachelor in decades. Then he starts dating the former chief’s daughter, and wham! His wife shows up in town! Lenora: (throwing her head back and laughing) Biggest surprise this town has had in years! Quite a bombshell, with that great figure and mysterious Russian accent. Irene: But not so great for our new friend, Liz. Like the rest of the town, she thought he was single, too. Lenora: (instantly sobered) Very true. Irene: Now everything’s all tense. He’s avoiding Liz. Liz is avoiding this Marya woman. Hank McCall, Liz’s father, looks like he could punch out the new chief. Lenora: I’d make popcorn, but I’m afraid it would get stuck in my dentures. Irene: I can’t wait to see how it all works out. Irene doesn’t have long to wait. 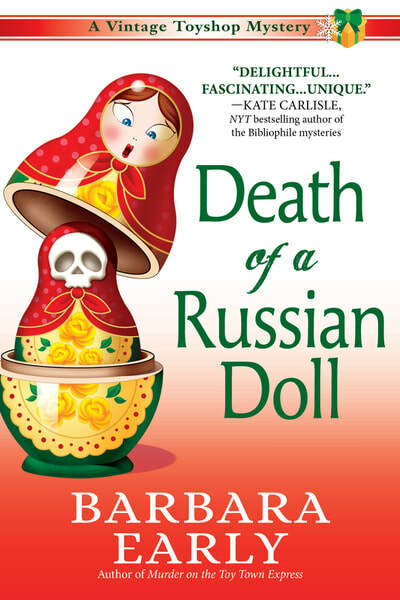 Find out what happens in DEATH OF A RUSSIAN DOLL, releasing October 9th! Liz McCall is not thrilled when her boyfriend Police Chief Ken Young introduces her to his estranged wife Marya. The model-quality Russian immigrant, back in East Aurora to rekindle their romance, will be working as a hairstylist at the barber shop next door to Well Played, the toyshop Liz manages for her dad. When Marya offers to help with the shop’s doll rehab project, Liz can’t help but offer up only a weak smile, but her secret hesitations are for naught when Marya’s body is discovered in the barber shop with a hair dryer cord wrapped around her neck.